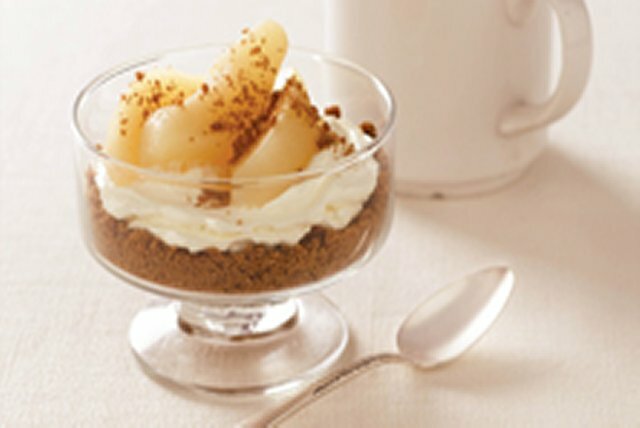 These Ginger-Pear Cheesecake Cups have all the flavour of a baked cheesecake in a 10-minute no-bake dessert! Drain pears, reserving 1/4 cup syrup. Slice pears; set aside. Sprinkle 3/4 of biscuit crumbs evenly into 4 dessert dishes. Mix cream cheese product and reserved syrup in medium bowl with whisk until well blended. Stir in Cool Whip. Spoon over crumbs in dessert dishes. Top with pears and remaining biscuit crumbs. Prepare as directed, substituting 1 can (14 fl oz/398 mL) peach slices for the pears.